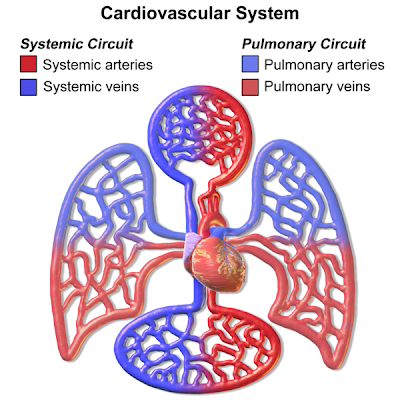 This is known as a double closed and complete circulatory system. 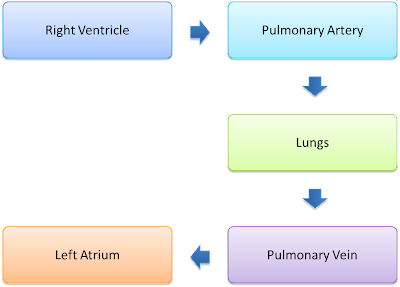 Pulmonary circulation is the part of the circulation of blood in human body which carries deoxygenated blood away from the heart, to the lungs, and returns oxygenated (oxygen-rich) blood back to the heart. Figure above shows the illustration of the pulmonary circuit. The deoxygenated blood (blue in colour) is pumped out from the right ventricle into the left and right pulmonary arteries and then to the left and right lungs. At the lungs, the deoxygenated blood receives oxygen and becomes oxygenated blood (red in colour). The oxygenated blood is then transported from the lungs to the pulmonary veins and then the left atrium of the heart. Systemic circulation is the part of the circulation of blood in human body which carries oxygenated blood away from the heart to the body, and returns deoxygenated blood back to the heart. During a systemic circulation, oxygenated blood from the left atrium of the heart is pumped into the left ventricle and then pumped out of the heart through the aorta. From aorta, the oxygenated blood is pumped to all the body tissues through arteries. 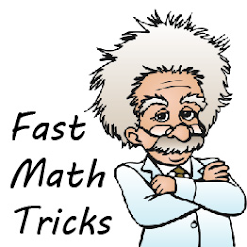 Oxygen is released whereas carbon dioxide is collected from the body cells. The blood is then become deoxygenated. The deoxygenated blood is pumped back to right atrium through the vein and veca cava. This video gives a complete explanation on circulatory system. However, it is a bit long.